Zack Giffin grew up in the small mountain town of Gold Hill, Colorado and was the middle child of three brothers in a tool manufacturing family. 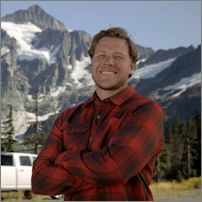 In the fall of 2011 he built his first tiny house with Outdoor Research, living and traveling to various mountain areas in the western US for three years before being hired to be the host of a television show called Tiny House Nation. Now in the end of the third season and with over 40 tiny homes built, Zack has become a prominent figure in the tiny house movement and is passionate about sharing the joys and lessons of living tiny to the greater world populace.